MIAMI DADE / 170 MPH WIND ZONE. BROWARD / 160 MPH WIND ZONE. PALM BEACH / 160 MPH WIND ZONE. The following is the breakdown by wind zones and hurricane exposure for coastal and non-coastal zones. The 2010 building codes and requirements have been enacted in Florida to provide increased protection of lives and property in areas subject to hurricanes. Because code standards and requirements vary among local jurisdictions, please check the wind zone map for your area. 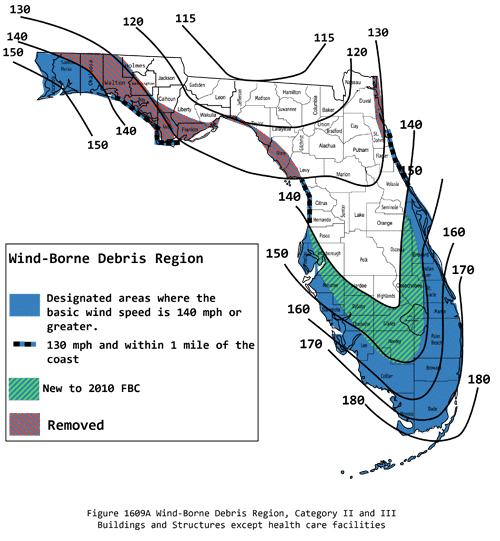 Our screen enclosures are designed to meet or exceed the requirements of city and county requirements throughout the wind-borne debris region all over South Florida. Thinking about a screen enclosure? Whether you’re expanding, building, or completely renovating your patio area, we can help with a home improvement loan solution for you. Contact us today for more information.